Wow! It's Tuesday again and that means the start of another challenge at Tuesday Throwdown. This week we want to see your embossing skills. Our lovely sponsor is Sweet 'n Sassy Stamps and they generously provided the design team with a choice of digital images to use on our creations. I'm using Lilacs for Cocoa on this Hello Fabulous Card. For all the challenge details and design team inspiration click here. I hope you will share your embossed creation with us this week. Paper: Whisper White and Blushing Bride cardstock by Stampin' Up!, Green Apple cardstock by Simon Says Stamp, Lilac patterned paper from Butterfly Kisses paper pad by Bo Bunny and light purple scrap paper. 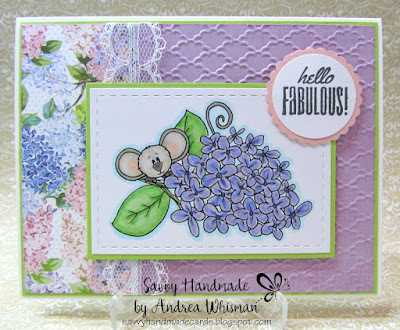 Stamps: Lilacs for Cocoa by Sweet 'n Sassy Stamps. Hello Fabulous! sentiment by Fiskars. Inks & Coloring: Memento black ink and Copic Markers. Other Stuff: Big Shot, Fancy Fan embossing folder by Stampin' Up! (retired), 1 1/4" circle punch, scalloped circle punch, rectangle stitched die by Lil' Inkers, white lace from Ribbon Resources and dimensionals. Sweet design -- colors and papers all just perfect and the graphic is really sweet also. Aw, such a darling image. I love the soft pastel colors and the touch of lace and dry embossing. Thanks for playing with us over at Cards in Envy! Beautiful card and such wonderful texture, color and gorgeous image! Thanks for sharing with us at Cards in Envy.